You are important to us and we want to help with your legal problem. If your legal problem is an emergency or involves a rapidly approaching deadline, please call our new client number: 1-877-777-6152 and follow the prompts for a legal emergency. You will receive a call back as soon as possible within in a few days. If you are in immediate physical danger call 911 right away. Legal Services of Central New York serves a 13-county region of Central New York which includes Broome, Cayuga, Chenango, Cortland, Delaware, Herkimer, Jefferson, Lewis, Madison, Oneida, Onondaga, Otsego, or Oswego. If you have a legal problem related to HIV/AIDS or Cancer, we can also accept applicants from St. Lawrence, Tioga, and Tompkins counties. We represent people with limited income and assets. 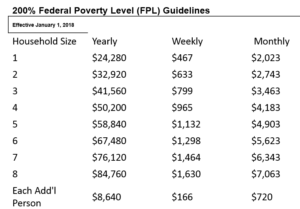 Eligibility is typically determined, in part, by the Federal Poverty Level. When you speak to one of our team members, they will ask for more detailed information regarding your household income and assets. Have you or any member of your household ever served in the military, including the National Guard?